Implanturile cu incarcare imediata nu sunt o descoperire recenta, ele dateaza din anii ’70 – dr Julliet, Scortteci-Franta, urmati in dezvoltarea acestor implanturi pana astazi de dr Mutter, Kopp si prof dr Ihde. De atunci si pana astazi au aparut noi tehnici de inserare a implanturilor: fara incizie, postextractional, bypass de nerv mandibular. Toate aceste noi tipuri de implantare au fost posibile datorita unui colectiv international de medici in frunte cu prof dr Ihde Stefan, care au dezvoltat si modificat tehnici de inserare a implantelor si de imbunatatire a acestora. Avantajul major al acestor tehnici de inserare al acestor implanturi este dat de posibilitatea incarcarii imediate, inclusiv la pacienti cu boli sistemice gen diabet zaharat. – implanturi cu incarcare imediata tip BCS multicorticale, ce pot fi utilizate si fara incizie in toate tipurile de oferte osoase si la pacienti cu anumite boli sistemice. Lucrarile protetice ce trebuie executate intr-un timp scurt 3-4 zile sunt in cea mai mare parte lucrari metaloacrilice cu dinti prefabricati din compozit. Acestea pot ramane ca si lucrari definitive sau pot fi schimbate dupa 9-12 luni cu lucrari metaloceramice sau zirconiu. Aceasta se datoreaza faptului ca zona postextractionala are o vindecare estetica imprevizibila, care este mascata in primele luni prin aceste lucrari metaloacrilice. Atat in implanturile cu incarcare imediata, cat si in cele multifazice, vindecarea tesuturilor moi si a celor dure este la fel, diferenta este data de posibilitatea de rezolvare a cazului imediat, fara perioade lungi de asteptare postextractionala, aditii, sinus lift, de luni sau ani de zile pana la finalizare, precum si posibilitatea rezolvarii cazurilor dificile cu atrofie de maxilar si mandibula. KOS D implants feature an 4°external-cone. Abutments are simply tapped on or cemented. The abutments may be positioned on the external cone in different distances from the bone line: 1.5mm, 3 mm, or 4 mm (patent pending). For the „KOS D“-implant system no implant analogues nor impression caps are needed: the impression is taken directly on the abutment. The abutment is shaped like a tooth in the prosthetically desired way. „KOS D“-abutments are compatible with „Hexacone D“ and „Xigñ D“ – implants. KOS E Implants are single-piece fixtures. They are used in the esthetic zone. The implant bed is prepared with KOS instruments. The prosthetic components of the S class implant lab accessories (especially the CSK system) are fully compatible with KOS E. Made of Ti6Al4V titanium alloy, doubly sandblasted, with Osmoactive® coating. KOS EB is a single-piece implant featuring an inverted cone to compensate for diverging paths of insertion. KOS EB Implants are custom milled and shaped immediately after placemen. The gingiva retractor is used to expose the preparation margin. Made of Ti6Al4V titanium alloy, doubly sandblasted, with Osmoactive®coating. KOS T implants are best used in the tuberosity region and in areas where the mucosal layer is thick. The polished head is twice as long as that of the KOS® implant. At the same time, the neck diameter has been reduced to 2.3 mm. Materials: Ti6Al4V, doubly sandblasted, coated with Osmoactive®. Perfectly manufactured precision implant with double-sandblasted endosseous section made of highly fracture-resistant Ti6Al4V ELI titanium alloy KOS K Implants with ball attachment connect to the superstructure using nylon copings. KOS® X implants provide the same prosthetic platform (cementing head) as BCS 3.6 mmd, BCS 4.6 mmd and larger. KOS® XB implants provide the same prosthetic platform (cementing head) as BCS 3.6 mmd, BCS 4.6 mmd and larger. Screw-type implant, bicortically inserted, for use with dental bridges. Assuming the indication permits, this implant can be inserted in the extraction socket immediately after extraction and loaded immediately in many cases. Smoothly machine-surfaced in all areas. The abutment head is identical with the KOS implant head and with a TSD4 abutment. Self-tapping thread, with endosseous anti-reverse protection. ZSI-Implants are placed trans-sinualy or below/inside the crista zygomatico-alveolaris, and in the alveolar crest of the maxilla. For cortical anchorage in the zygomatic bone. Smooth parts of the implants are positioned below the Schneiderian mebrane or below the muscosa. Additional they provide a bending area below the cementing abutment. Therfore they can be aligned with other abutments in the center of the crest after the implant has been placed. Perfectly manufactured precision implant with double-sandblasted endosseous section. Implant with internal octagon and 8°internal cone. For anti-rotational superstructures. These implants with a head diameter of 6.5 mm can be used, if adequate bone is available, for posterior single crowns with the width of one premolar in dentate and partially/fully edentulous ridges as for superstructures retained by bars and ball attachments. Perfectly manufactured precision implant with double sandblasted endosseous section. Implant with solid conical abutment (cf. TCA7 STI abutment). Suitable for crowns, bridges and bar connectors. Direct impression on the TCA implant. The abutment can be shortened or bevelled immediately after placement. Perfectly manufactured implant Double blasted on theenossal section. Successful implant with octagon socket and 8° inner cone. For rotationally-secured suprastructures. Implant with octagonal abutment (like OSA STI). Suitable for crowns, bridges and bar connectors. 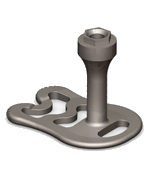 Perfectly manufactured precision implant with double-sandblasted endosseous section. Implant with 8°internal cone. Compression screw thread for stable endosseous anchorage. Perfectly manufactured implant Double blasted on the enossal section. Proven implant with 8° internal cone. Versatile classic. Perfectly manufactured precision implant – double radiated on the enossal section. Implant with octagon socket and 8° inner cone. 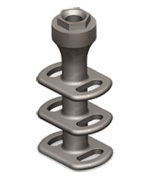 Compression screw thread for stable enossal anchorage e.g. Hexacone 6+2 has been developed for the area of the molars in the upper and the lower jaw. In the upper jaw this implant may be used as a compression screw. Endosseous length 6mm. The upper border of the 75° reverse konus should end at the level of the bone or slightly above it.The surface is sandblasted and acid etched (high temperature). After this the implants receive an osmoactive coating or are packaged in concentrated osmoactive solution. Hexacone® DIRECT was developed for small gaps. Provided that the bone quality is adequate, the treatment can be finsihed in an immediate load protocol (within 3 days). For insertion use the specific instruments (IT K). The bone cavities should be prepared 2.0 mm or 2.2 mm. The implant may be used in the way of a compression screw in soft bones. In this case use only the drills BCD1 or BCDX1. The surface is sandblasted and acid etched (high temperature). After this the implants receive an osmoactive coating or are packaged in concentrated osmoactive solution. The surface is sandblasted and acid etched (high temperature). After this the implants receive an osmoactive coating or are packaged in concentrated osmoactive solution. 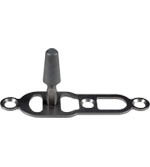 The implant features an internal hex, a marginal taper and a US standard internal thread. Its internal geometry is compatible with systems such as MIS®, Paragon®, CoreVent®, Screw Plant®, as well as Alpha Bio®. Lateral implant for dental and maxillofacial applications. The implant bed is prepared using the rotary instruments of the BOI®implant system.